Women of all shapes will appreciate this Ladies Modern Stretch Cotton Cardigan. Sapphire Blue with Blue Ribbon embroidery on left chest. Available in S-2XL. For Blue Mondays, casual Fridays or after hours, this chambray shirt has a lived-in look and trim fit. 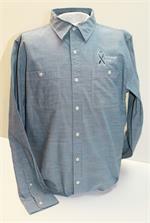 Light Blue with Blue Ribbon embroidery on left chest. Available in M-3XL.